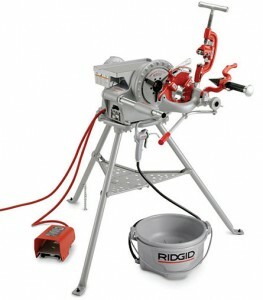 The Ridgid 300 is a mainstay of the pipe threading world; with a standard threading range of between .125 and 2 inches, the 300 can incorporate various attachments to give it an enhanced range of up to 6 inches. This version of the 300 model comes with a stand, carriage with lever, universal die head, alloy dies that range between .125 and 2 inches, an oiler, and a pipe stand. This version is equipped with both a pipe cutter and a pipe reamer, to keep your pipe neat and clean while working, and a foot switch for emergency power cut-off.